Tim Stock is the Co-Founder and Managing Director of scenarioDNA, a New York City based foresight consultancy that focuses on global innovations. I came across his work through a LinkedIn group where he had been kind enough to share a presentation deck that was fascinating. Stock also works as an Assistant Professor teaching trend forecasting and innovation at Parsons' The New School making him a wonderful industry insider to learn from. Here are his insightful gems of knowledge. Could you tell us about how you established yourself in field of foresight? It was an evolutionary process. I have always had a bit of a hybrid in skill set. By nature, as a musician, I have always seen things in patterns. Training in semiotics and cultural theory, compounded by the application of technology contributed to the bigger picture of establishing a context for trends. I have seen companies cycle through the last few decades from brand strategy to digital and mobile strategies to more recent obsessions around data science. My skills have converged to answer emerging issues that companies are seeking to solve. Having a framework for context is invaluable when conducting ethnographies across global markets. If you can read culture you can read how the future is unfolding. In laymen's terms, what is culture mapping? In laymen’s terms, it is a galaxy map of how people are thinking. We are simply organizing words like stars on a grid. The mapping reveals constellations. Those constellations are clusters of ideology. 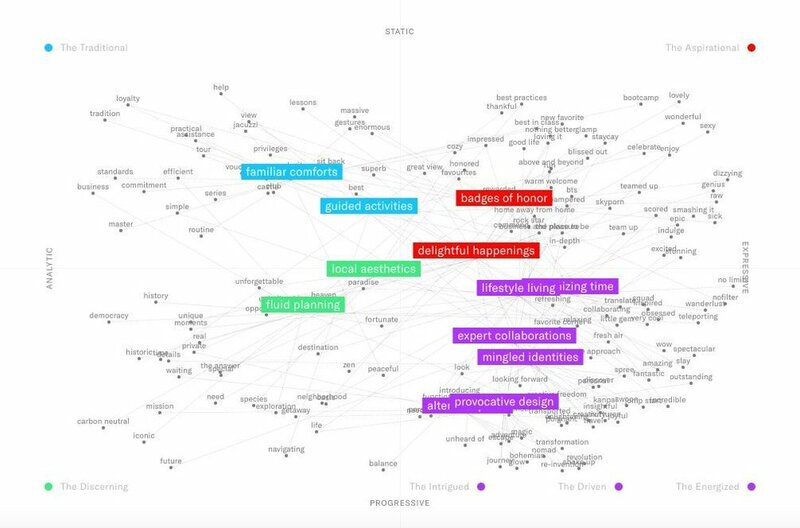 We use natural language processing and computational linguistics to map the words and quantify their interrelationships.. That data science helps make the picture of ideologies clearer. We developed this method to visualize patterns and chart trends as they emerge. It allows us to find important cultural signals earlier and use machine learning to augment that analysis so we can find patterns missed in traditional analysis. We received a utility patent for this method in 2015.
scenarioDNA also hosts culture mapping workshops, what kinds of professionals should attend? The main attendees of our workshops are coming from brands. They are typically trying to understand how to leverage culture better. They are flooded by trendspotting and want to make better sense of things. They get excited when they decode and apply the underlying meaning of trends. It helps them innovate. You can find the Mapping Culture e-book here and scenarioDNA's trend reports here. Company and university culture mapping workshops can be arranged by email culturemapping(at)scenariodna.com while a workshop is coming up on September 10 in London.